"Incredibly rich chocolate cake made even more decadent with the addition of port wine." In the top of a double boiler, melt unsweetened chocolate and 3/4 cup butter, stirring occasionally, until smooth. Set aside to cool to room temperature. Preheat oven to 350 degrees F (175 degrees C). 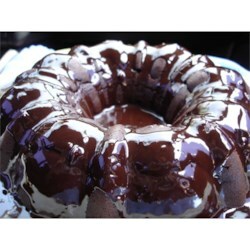 Grease a 10 inch Bundt or tube pan. In a large bowl, beat egg yolks and 3/4 cup sugar together with an electric mixer on High speed until light and fluffy, about 5 minutes. Gradually stir in the 3/4 cup of port wine and flour. Fold in the cooled chocolate mixture. In a clean bowl, whip egg whites with cream of tartar until frothy. Gradually whisk in 3 tablespoons sugar, and continue to whip until stiff peaks form. Fold 1/3 of the whites into the batter, then quickly fold in remaining whites until no streaks remain. Quickly fold in walnuts. Pour batter into prepared pan. Bake in the preheated oven for about 45 minutes, or until tested done with a toothpick. Cool in pan 10 minutes. Invert onto serving plate. Cool completely. To make the glaze: In the top of a double boiler, over lightly simmering water, combine chocolate chips, 1/2 cup butter and corn syrup. Stir frequently until chocolate is melted. Stir in the remaining 1/2 cup port wine and vanilla until mixture is smooth. Set aside to cool for about 30 minutes. Pour glaze over the cooled cake. Make rich and impressive single-serving chocolate cakes. Absolutely sinful! I had some old port that I needed to use, and it turned out to be the most raved-about item on my menu! If you have the ingredients to make this recipe, I'd recommend making something else with them. This was okay. It was VERY dry. There are SO many better chocolate dessert recipes out there.